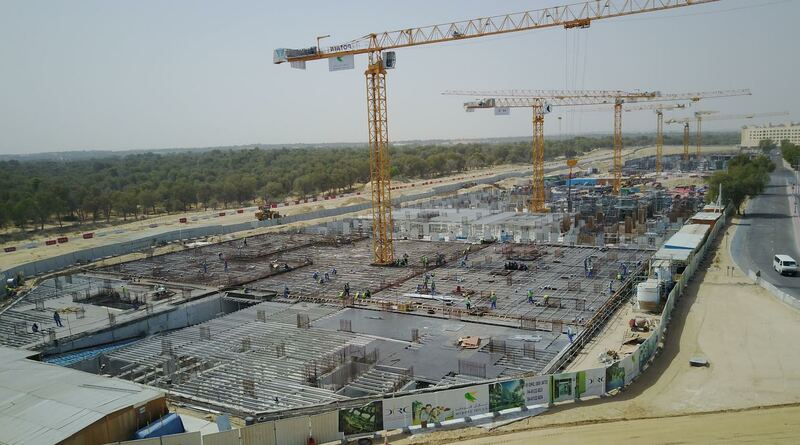 Mirdif Hills construction progresses as per schedule. Dubai: Dubai Investments Real Estate Company [DIRC], a subsidiary of Dubai Investments PJSC [DFM: DIC], has announced the completion of preparation work including excavation and shoring works for the first phase of its AED 3 billion Mirdif Hills project, currently under construction in the Mirdif area of Dubai. The first phase of Mirdif Hills – the only freehold in Mirdif now – includes 1,054 apartments in its three components, Janayen Avenue, Nasayem Avenue and Al Multaqa Avenue. Foundation works for Janayen and Nasayem Avenues are nearly 75% complete as of May 2017 and ground floor slabs are under way. The mixed-use project is expected to be fully completed by end of 2018. The project offers a mix of residential, commercial and retail attractions spread across an area of 3.9 million square feet. These include studio, one, two, three-bedrooms & duplex apartments; a four-star hotel with 116 rooms, 128 serviced apartments & a 230-bed hospital. The main project contractor is Engineering Contracting Company [ECC]. DIRC, which has unveiled sales of the first component – Janayen Avenue, has on offer flexible payment plans for investors. These include 30% payment during the construction phase, and the balance 70% on handover, making the process easier for buyers with extended payment terms. As per the plan, a 10 per cent down payment is to be made on booking, followed by 5% on signing the sale and purchase agreement within the next 60 days, 5% within six months of the booking date, 5% within a year of booking, and 5% within 18 months of the booking date. The balance 70% payment can be made on handover. DIRC will launch the sales of Nasayem Avenue shortly. The Nasayem Avenue contains a mix of residential buildings, providing units ranging from 2 and 3 bedroom apartments to 3 and 4 bedroom duplexes. One of the unique facets of Mirdif Hills is its Vertical Villas concept, which is gaining international popularity. Inspired by French architect Le Corbusier, the Vertical Villas series – being built in the Janayen Avenue, comprises many villas, built in one single building and rising up vertically giving it a sustainable and environmentally friendly appearance.